I discovered the World’s Best Sandwich almost two years ago, before I was an actual foodie. Every week I had to drive to Salem, forty-five minutes without traffic and there would always be traffic. It was excruciating, but what saved me was this sandwich that made the trip, the traffic, and my day totally worth it. This legend I speak of is the Vietnamese ham sandwich at Best of Boston-winning and Phantom Gourmet-approved A&J King Artisan Bakery in Salem, Massachusetts. Tucked into the shade down a one-way street, you will miss the bakery if you aren’t on the lookout. The space is quite small — with only a handful of tables, it is especially tiny for the lunchtime crowd. (More about this later.) 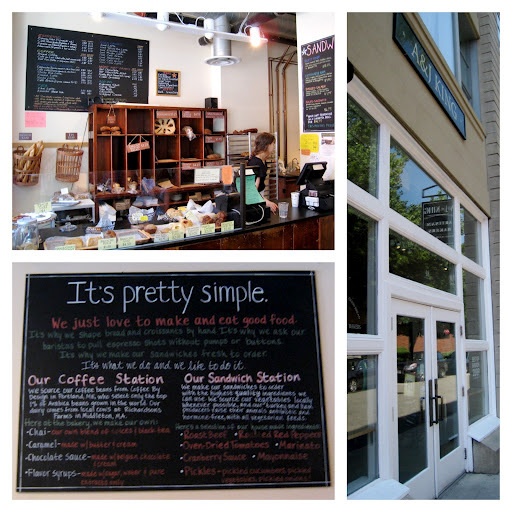 But the smallness only adds to the “local artisan bakery” ambiance. A&J King is best-known for its varieties of yummy bread. They have a great breakdown of baking methods page on their website — a very interesting read, which I recommend. If I lived closer, this bakery would absolutely be my go-to place for any and everything bread-related. Now, I cannot write about A&J King without noting that I affectionately refer to the incredible Vietnamese ham sandwich as the “spa pig sandwich.” Wait, wait…I can explain. The Vietnamese ham, aka “spa pig” sandwich consists of “jambon royale” ham, pickled carrot and daikon radish, cucumber, cilantro, and house-made mayonnaise. It comes on a baguette, but I typically order it on stirato because it’s my favorite bread they have. 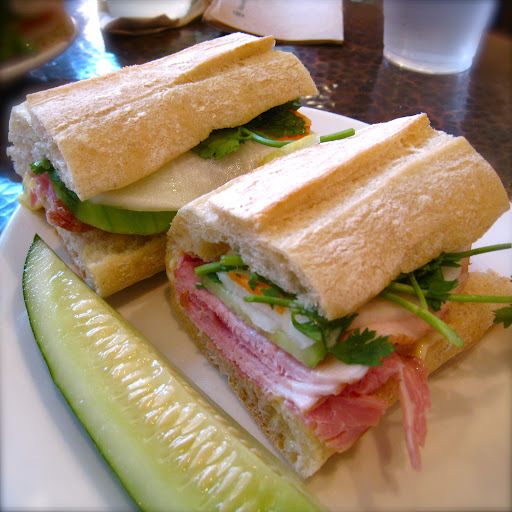 The Vietnamese ham “spa pig” sandwich on stirato (not baguette): jambon royale, pickled carrot and daikon radish, cucumber, cilantro, and house-made mayonnaise. Since I moved south, the drive to Salem has lengthened to an hour and fifteen minutes…without traffic, and there is always traffic. But I can’t stop thinking about this sandwich. I trek to Salem more often than most people would drive anywhere for one sandwich, but still not nearly as often as my taste buds request. After I place my order, doubt creeps in. This sandwich could not possibly be as incredible as I remember it — delicious absolutely, but I have built it up in my mind to be something that a sandwich alone cannot be, and subsequently set myself up to be disappointed. I anxiously watch the counter. I glance at the sandwich board. I check my phone, as if that has any relevance to the situation. And then I take a bite. Soft stirato bread, tangy pickled carrots and radish, flavorful cucumber, umami-happy mayonnaise, a touch of cilantro, and perfectly salty ham. Heaven in a sandwich. Just as good as I remember. Every time. A&J King has lots of other sandwiches too. The roast beef, turkey, and smoked salmon sound particularly up my alley palette-wise. I regret to say that I will probably never get around to trying them because I am religiously obsessed with the spa pig sandwich. I can also attest that A&J King’s coconut-almond macaroons are hands-down the best macaroons I have ever had. Their sticky buns rock some serious game too. At lunchtime, A&J King is bustling. It may be secreted away down a side street, but the locals are well aware of it. You walk inside and see the small number of tables and the growing line of people waiting to order, and you feel dismay. “I drove all this way and now I won’t be able to sit.” But in all my visits, that has never happened. People take their food to go, other people turn over tables. I always find someplace comfortable to sit. Somehow it works. At my most recent trip to A&J King, I finally inquired about where they obtain the delicious, delectable, not-too-fatty, salty ham on the “spa pig” Vietnamese ham sandwich. The answer: Niman Ranch in California. (Which I henceforth dub, “The Spa for Pigs.”) At first I was surprised to learn that they buy their ham from a ranch all the way across the country, but on second thought it fits with the artisan bakery atmosphere: When they prepare food, they use the absolute best ingredients possible and cut no corners. Stop in if you get the chance. It will be worth the trip, I promise! What a cute bakery! And the "spa pig" sandwich looks incredible. Reminds me of a banh mi! A&J King just well-deservedly won Best of Boston's "Best Bakery, North" category! 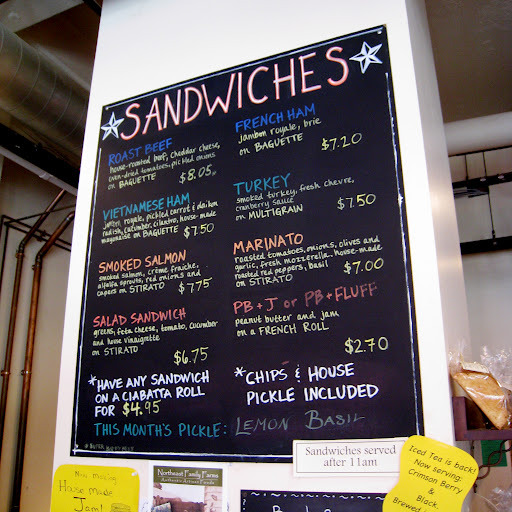 And yes, I think the "spa pig" sandwich is very like a banh mi. I've seen similar-sounding sandwiches on other Boston-area menus but have never actually tried one to compare — I'm too married to A&JK King's, it wouldn't be fair!